Also scheduled to be released is the new POE Ethernet repeater that allows the extension of Ethernet and Power over Ethernet over Twisted Pair Wiring beyond 100 Meters without power outlets needed (2-400 Meters). Supports high security Ethernet and VLAN’s. Professional Sales Representatives, LLC: has been named the KUSA West Coast Representative and Field Marketing Team. Effective immediately PSR will be representing KUSA for Industrial Ethernet sales and support. PSR will cover 13 western states including: California, Colorado, Idaho, Alaska, Hawaii Washington, Oregon, Nevada, New Mexico, Wyoming, Montana, Utah and Arizona. PSR will be representing KUSA Industrial Hardened Security Ethernet Networking products and provide distributor training, product demonstrations, system layout and design. Keller & Associates will be representing KUSA Industrial Hardened Security Ethernet Networking products and provide distributor training, product demonstrations, system layout and design. Central Manufacturers Representatives: has been named the KUSA North Central Midwest Representative and Field Marketing Team. Effective immediately CMR will be representing KUSA for Industrial Ethernet sales and support. CMR will cover the North Central states; including: Ohio, Michigan, Western New York, Western Pennsylvania, West Virginia, Kentucky, and Indiana. CMR will be representing KUSA Industrial Hardened Security Ethernet Networking products and provide distributor training, product demonstrations, system layout and design. Morris Electronic Sales Inc: has been named the KUSA Southeast Coast Representative and Field Marketing Team. Effective immediately Morris Electronic Sales will be representing KUSA for Industrial Ethernet sales and support. Morris Electronic Sales will cover the Southeastern states; including: Georgia, Tennessee, Alabama, North Carolina, and South Carolina. Morris Electronic Sales will be representing KUSA Industrial Hardened Security Ethernet Networking products and provide distributor training, product demonstrations, system layout and design. KUSA is a Veteran Owned Small Business (VOSB) and Minority Business Enterprise (MBE) Eco- Engineering Company, and the leader in designing environmentally friendly, energy efficient, secure Industrial Ethernet network communication products. Our products are designed and engineered “GREEN” for lower cost, higher performance, secure, energy saving operation. 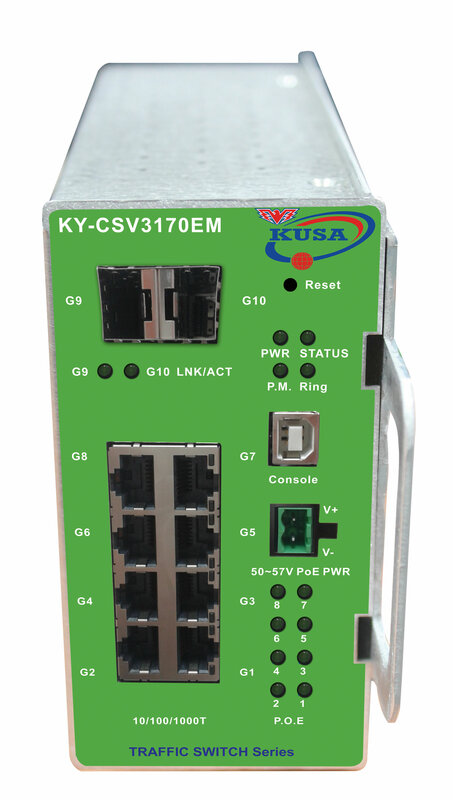 KUSA designed and engineered the KY-3170 Traffic Ethernet card rack switch. The switch set a new record for low power consumption – saving cities across America, hundreds of thousands of dollars in electrical costs. We enable the development and delivery of secure interactive communications: voice, video and multimedia sessions. Data services across legacy communications and the IP network border to exceed the demands of the Industrial Power Utility, Security & Surveillance and Intelligent Transportation System markets. We deploy high security Ethernet using Cyber Secure Video and Clean Code Technology. We are proud to make our products – In Kansas City, Missouri - USA. American Pride – American Innovation. For more information, please contact KUSA at: Telephone - (219) 595-2631 or (816) 988-7861.